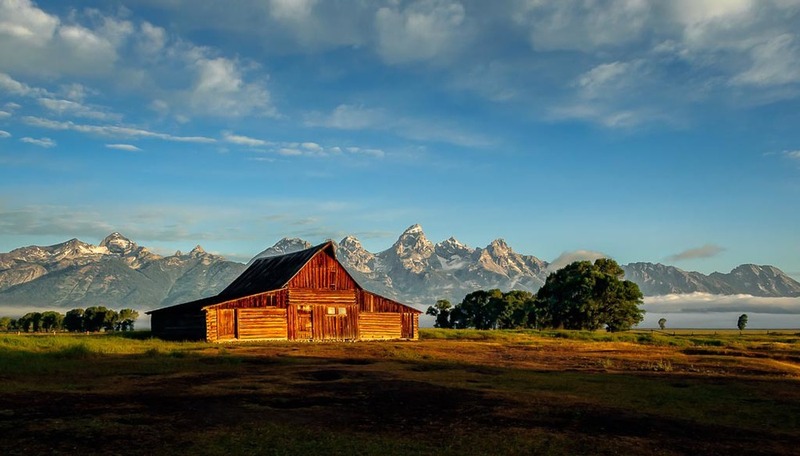 This past July, I posted this pre-dawn image of the historic Thomas Moulton barn, located in Grand Teton National Park, Wyoming. The reason photographers get up before dawn and set up for this shot is that the window of opportunity to get the morning light shining on the front of the barn is quite small. There are many mornings when the cloud cover to the east blocks the sun totally. That is what we worried about on this morning. There were enough clouds and fog that threatened the light, but the sun finally made its appearance, which gave the barn this golden glow. The moment lasted for only 10 minutes before the magical light disappeared. The fog in the background was simply icing on the cake.